We are extremely happy to announce new Services for vSphere PowerCLI. These services are ideal for any organization building vSphere management scripts. Remember most of the things you can do with the vSphere Client you can do with PowerCLI. 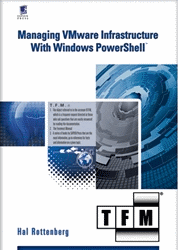 Education is key to unleashing the full power of VMware vSphere PowerCLI. Make certain that your IT professionals have the product training they need to fully utilize your investment in VMware solutions. Register today for our new VMware vSphere: Automation with vSphere PowerCLI course. VMware vSphere: Automation with vSphere PowerCLI is a two-day, lab-intensive course designed to teach your IT managers, system architects and system administrators how to automate all tasks with vSphere PowerCLI. Upon completing the VMware authorized training; your team will have gained hands-on experience and obtained the knowledge to fully utilize this powerful software from the product experts—ultimately, saving your organization time and money. The best way to ensure that your organization uses VMware vSphere PowerCLI to its fullest functionality, i.e., to automate all aspects of VMware vSphere management, is to make certain your team has the product knowledge they need to be successful. Classes are available around the world and even online. Access the course details and find the class that fits your schedule and register today. The VMware PowerCLI Support Program provides guidance when building PowerCLI scripts. The program has primarily been targeted at ISVs and now is available to VMware Customers and Partners. The Support teams have extensive experience working with the vSphere APIs and CLIs possessing in-depth knowledge around the intricacies of the powerful vSphere APIs. This program is ideal for Independent Software/Hardware Vendors (ISVs/IHVs), commercial and enterprise organizations building solutions for managing the vSphere platform. Can I do this task with PowerCLI ? I tried it, and it’s not working. Did I do it correctly? It doesn’t perform like it is supposed to. Is this a bug? This entry was posted in Advanced, Cluster, ESX, Extensions, Guest, Hardware, Logs, Network, Performance, Reporting, Storage, ThirdParty, vCenter, VMworld and tagged vmware official support training for powercli on September 22, 2010 by Pablo Roesch. vSphere PowerCLI – Thank you for a great VMworld 2010 – SF ! Just wanted to thank everyone for your support and helping us make the VMworld 2010 – SF a great event. We were truly blown away by your support and enthusiasm. I put together a few photos to help us all relive the moments hope you enjoy. Thursday PowerCLI Session is for Administrators by Luc and Alan – Full House. Poster mad rush – thanks for your support everyone. We promise to print more. I can still hear the roar of the crowd. Great team work ! Last Session with over 700 people attending. Thank you everyone ! This entry was posted in ESX, Extensions, Guest, Performance, Reporting, Storage, ThirdParty, vCenter, VMworld and tagged powercli vmworld 2010 on September 9, 2010 by Pablo Roesch. There’s been a lot of PowerCLI-related stuff going on lately that’s worth checking out. Monsieur Alan Renouf has been hard at work lately and had turned out some really amazing stuff. The first is what he calls vProfiles. From the looks of it, vProfiles is still in a fairly early stage, but right now it is able to duplicate virtual switch and portgroup information between two ESX hosts via a graphical interface. Alan also posted a video showing the script in action. This looks really exciting and Alan is looking to improve its functionality over time to include more than just networking. Chances are it’s also very easy to extend this to apply a configuration to an entire cluster rather than just a single host, and I think we’ll see that ability pop up in the near future. Another really cool script Alan wrote recently was SnapReminder. SnapReminder will automatically generate an email nag to anyone who has left a snapshot sitting around too long. The most notable thing about SnapMinder in my opinion is that it blends together information from VMware vSphere and Active Directory in a completely seamless way. As if that weren’t enough there are some other great scripts Alan wrote between these two that are also worth checking out. vWire is a new product from the people who brought us Tripwire (some of us feel old when we think about the first time we used Tripwire.) Anyway, the vWire team has taken some of this knowhow and have produced a tool to monitor and analyze your VMware environment, and keep it running smoothly. vWire has some videos that can help you get started, particularly their getting started video. vWire also offers some really powerful, SQL-based searching capabilities. You may be wondering what this has to do with PowerCLI, but vWire supports script actions, which let you run PowerCLI scripts to do things like display log files or change ESX host configuration. You can see all their content in their content library. vWire lists for $295 per CPU + Support, and if you’ve got more than a very basic Virtual Infrastructure vWire might a great addition to your portfolio of management tools. Lastly, but not leastly, PowerWF Studio. There are a lot of great PowerWF videos on YouTube but one of the best ones right now shows you you can take a PowerShell script you have already written and embed it in a workflow. If you’ve ever visited our communities, or read PowerCLI blogs you know that there are hundreds of really useful scripts out there that solve myriads of problems. With PowerWF it’s now easy to embed these in workflows. As PowerWF continues to add more actions and adds the ability to talk to more and more software products it should be a tool worth watching. This entry was posted in ThirdParty on June 30, 2009 by Carter Shanklin.